Revisiting SHERLOCK: Series 2, Episode 2 - The Hounds Of Baskerville | Warped Factor - Words in the Key of Geek. Tony’s not a dog person. When you take a long look at the Sherlock Holmes stories, you realise that to call any particular story ‘The Big One’ is to do something of a disservice to many of the others – Holmes and Conan Doyle had plenty of ‘Big Ones’ that had nothing to do with glowing-eyed devil dogs on the misty moorlands. Still though, there’s something about The Hound of the Baskervilles that sends a shiver of anticipation down the spine, something intensely, fantastically incongruous about the idea of Sherlock Holmes out on the moors, unfriendly mists swirling as a giant hound of Hell menaces him, that makes the story stick in our minds. Possibly the enduring allure of The Hound of the Baskervilles is rooted in the idea that for the arch-rationalist Holmes, it’s the closest we get to the genuinely mystical or supernatural, the closest his crime stories ever get to crossing over into fantasy stories. For a city-based detective who spent much of his time recovering racehorses, or foiling art heists, or returning compromising photographs to the royal houses of Eastern Europe, this too does a disservice to the character, as much as the idea of him wearing a deerstalker in the city does (Sherlock Holmes was not a purposeful eccentric, he dressed correctly for all environments and seasons), but that’s what we remember of the character first and foremost. It’s the curse of Conan Doyle that so many elements of Sherlock Holmes were misinterpreted or stuck incorrectly in the public imagination that he was never entirely able to escape them. Still, The Hound of the Baskervilles endures among non-experts as ‘the story’ that everyone knows, though plenty wouldn’t be able to tell you the whys and wherefores or even the whos behind the mystery. Just…y’know, misty moors. Big dog. Oooh – scary. So – no pressure then, trying to update it. The question for writer Mark Gatiss was surely how much of the original to keep, and how much to jettison, with most Sherlock Holmes fans intensely curious on precisely how this would be done. 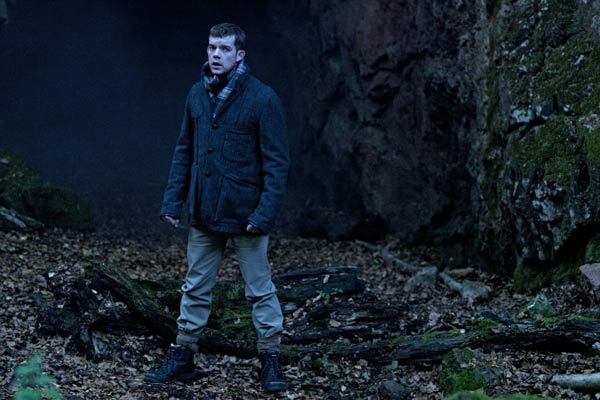 There are no bunkum ghost stories to send the chills up our spine in The Hounds of Baskerville, but Gatiss makes a number of clever moves. No ghost stories, but the modern equivalent – the conspiracy theory. There was a ‘gigantic hound,’ and ‘They’ built it. ‘They’ in this case being the conveniently situated top secret military weapons lab at Baskerville. Instead of dark dealings with devils and ghouls, there’s the threat of genetic mutation and weapons of biological warfare let loose on the moors to kill Henry Knight’s father twenty years earlier, and spawn a local industry in hound-spotting. The delicious faithfulness to the original of there actually being a local hound that’s got loose and gone feral is a big hat-tip to those who scrutinized this episode with special care, and while the convoluted Baskerville family history is largely jettisoned, it’s important that the story turns on a family mystery – Knight being haunted, still, by memories of the hound that killed his father, morbid thoughts that won’t let him rest, and that are slowly driving him absolutely mad. More than anything though, Gatiss plays to the reason we all love The Hound of the Baskervilles so much – that grey area of the arch-rationalist possibly dealing with things that shouldn’t be possible. Here we get his famous phrase – once you have eliminated the impossible, whatever remains, however improbable, must be the truth – but we get it because Sherlock Holmes, so sure that there is no giant glow-in-the-dark hound, sees it. He himself, Mr Superior Mind, sees something that he cannot believe, and the conflict between what he thinks his eyes have shown him and what he knows his mind can’t believe causes doubt. Doubt in himself, in his powers, in, to some extent at least, the rational world. Yes, he quickly finds a way to rationalize it – there must be a drug at work - but still, as he can’t find it, he’s working in that most terrifying area for those who carry their certainties with them, the grey, misty area of doubt. Gatiss evokes explicitly that powerful incongruity that we all subconsciously recognize – Holmes on the moors faced with a devil dog – and uses it to rattle the great detective, and create that sense of uncertainty in what’s going on as we watch. Gatiss also gives us a Houdini-like rationale – what’s really going on is so fantastical, so horrible, so utterly cynical that the human mind is almost pre-conditioned (by thousands of years of listening to lords and preachers and politicians) to accept the impossible, rather than to bend itself around that actual, secular solution, showing us hat hard work Holmes’ mantra is to live by – surely genetic engineering of giant glowing carnivorous beasts by a power with authority is a smaller step to take than a rogue scientist, with a chemical minefield of mind-altering, fear-inducing drugs and the cynical determination, for instance, to mess with the lights in Henry Knight’s world to keep him jumpy and on edge, to drive him over the brink of sanity simply to keep his own murderous secrets? On some level, the idea of rogue scientists doing madly unethical experiments (as opposed to officially sanctioned scientists doing madly unethical experiments) sends the modern version of the original Baskerville shiver down our spine – rogue brilliant scientists have the same essential vibe as revenant spirits; the urge to do harm and the power to fulfill their plans. The episode is crammed with effective performances, from Cumberbatch and Freeman on sparkling form to Russell Tovey playing Henry Knight with a nuance that came as a surprise to those not especially well-versed in his work, and from Clive Mantle (Lord Greatjon Umber in Game of Thrones and much else besides) to Amelia Bullmore as the dismissive Dr Stapleton of the Case of the Day-Glo Rabbit. 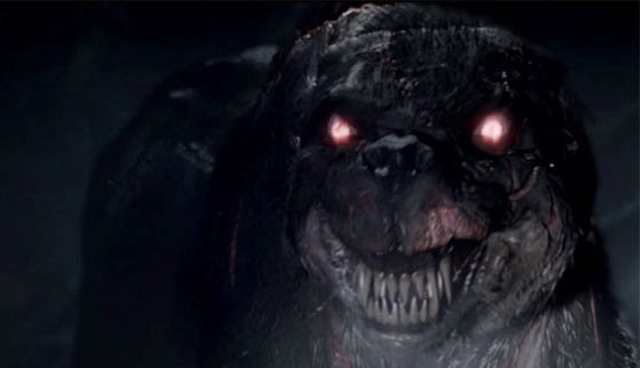 The Hounds of Baskerville also ventures, like the original, into dangerous territory – where The Hound of the Baskervilles was the closest thing to fantasy in the Sherlock Holmes canon, so The Hounds of Baskerville used the biggest effects shot in the show’s history to render its own trippy hellhound – dangerous territory because (like the original), Sherlock was consciously trying to root itself in a contemporary, rational world, and a badly rendered effect could have destroyed the reality of that world. From the very beginning, Sherlock had used on-screen text and images and innovative visuals to deliver the thought processes of the great detective, but in Sherlock’s Mind Palace (a device that would be seen again, particularly in Series 3), the technique reached new heights, giving us some sort of insight into the mind of Holmes – probably more than the books ever attained, because it went beyond the dependability of Watson’s narration or understanding. The Hounds of Baskerville still manages in Series 2 to feel like the least of the three episodes, but that’s no real fault of Gatiss’ or of any of the cast. It’s merely a reflection of the fact that A Scandal In Bohemia had The Woman, Irene Adler to (ahem) dominate the screen, and The Reichenbach Fall was a full-blown Moriartyfest, with Andrew Scott pulling out a solid handful of stops to dance his way deliciously through what could well have been the final battle between Moriarty and Sherlock. 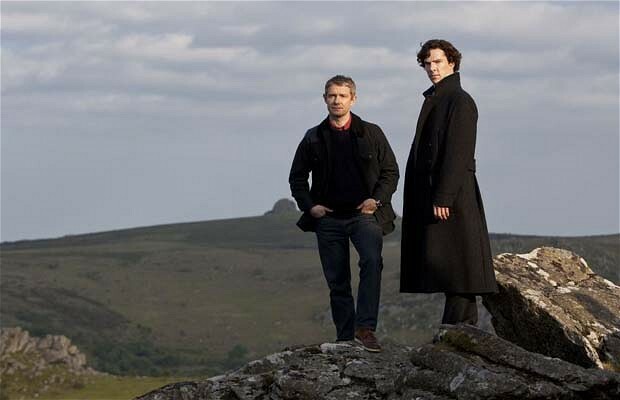 In between those two, the lack of a brightly coloured superplayer in The Hounds of Baskerville will inevitably make it feel like ‘the one in the middle,’ but watched on its own merits, the episode more than lives up to the promise of the original, letting Sherlock notch up another of ‘The Big Ones’ as a solid, successful psychological thriller.